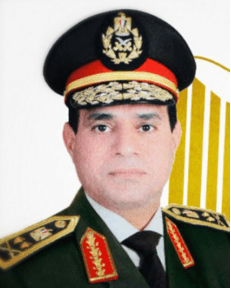 Sisi is a product of the military system: He attended the Air Force’s high school as a cadet, graduated from Egypt’s Military Academy (al-Kuliya al-Harbiya), and rose steadily through the ranks. He held a succession of senior positions within the military, both administrative and unit commands, becoming Commander of the Northern Military Zone in February 2008. Sisi was appointed as the Director of Military Intelligence in January 2010 after serving a stint as deputy director of the same agency. In that capacity, Sisi openly spoke about the use of virginity tests on female protesters in Tahrir Square in March 2011, and promised in June that they would not be used again. Following the deaths of 16 Egyptian soldiers in Sinai in August 2012, Egypt’s newly-elected President Muhammad Morsi forced the resignation of several senior military officials, including Defense Minister Field Marshal Hussein al-Tantawy and Chief of Staff General Sami Hafez Anan. Sisi was promoted to full general and appointed as minister of defense and commander-in-chief of the armed forces. Sisi was actively engaged in the fight against terrorism in the Sinai, visiting the region to inspect security facilities. Despite early rumors that he had been appointed because of his sympathy for Morsi’s Muslim Brotherhood—Sisi’s personal piety is well-known—Sisi warned as early as January, as the military intervened to quell unrest in the Suez Canal, that political events could lead to the “collapse of the state.” In April 2013, apparently speaking off-the-cuff, Sisi said, “Any hand stretched against Egypt must be cut off.” Both supporters and opponents of the Brotherhood interpreted his words as supporting their positions. Notable responses to security crises during Sisi’s period as Defense Minister include the strikes against militants in August 2012 and the more measured response following the abduction of troops in May 2013. As the possibility of mass protests on June 30, 2013 became evident, Sisi said” that, while the army would remain neutral in any dispute, it would not allow the country to descend into chaos; after the first day and a half of protests, the military released a statement giving political factions 48 hours to negotiate a power-sharing deal. On July 3, the military forced Morsi from office and installed Judge Adly Mansour as interim president. Less than a month later, Sisi called for mass demonstrations supporting a mandate for the military to fight terrorism. The military-led government used these marches as justification of their crackdown on pro-Brotherhood protesters in Cairo and other cities, which reached the peak of violence during the bloody clearing of the Raba’a al-Adaweya and Nahda protest camps, as well as continuing their violent opposition to militants in Sinai. The efficacy of the government’s attempts to eradicate violent opposition are debatable: Attacks on government forces throughout Egypt have been the norm since Sisi became the de facto leader of the government in July 2013, and have continued through his formal inauguration in June 2014.